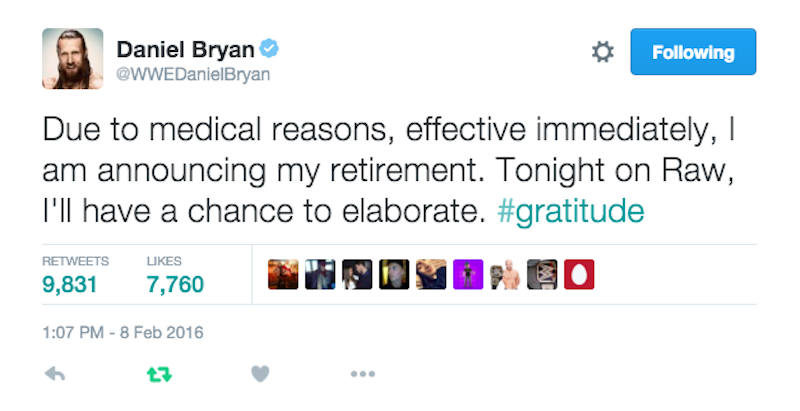 WWE wrestler Daniel Bryan, considered one of the best of his generation for his dynamic hard-hitting style, just announced on Twitter that he is retiring from wrestling for medical reasons. With pro wrestling, anything could be a storyline, but there’s reason to think it’s true. We recently chronicled the concussion issues he’s facing, his desire to return to the ring and the dilemma for fans rooting for a comeback. Bryan is slated to do an interview about this on ESPN tomorrow.